General Beadle’s new home is near the building named in his honor, Beadle Hall, on the DSU campus. 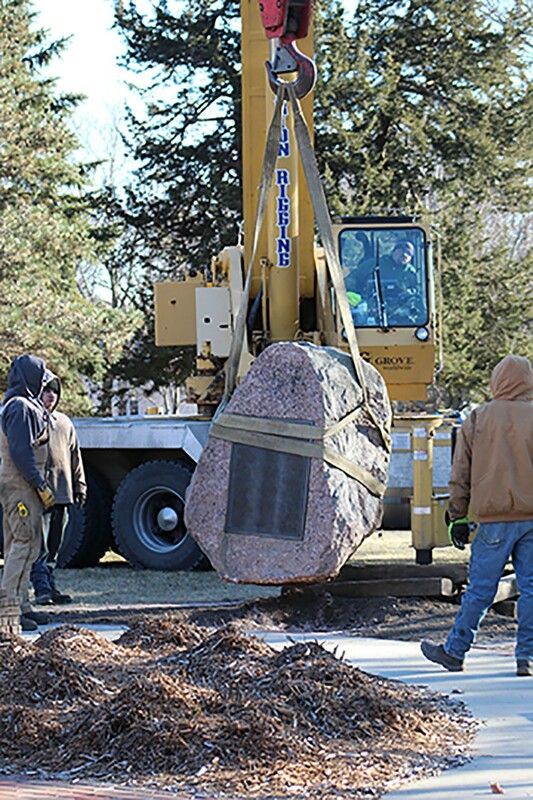 Two historic bronze monuments now have new homes on the Dakota State University campus. The statue of General William Henry Harrison Beadle has been relocated just north of the Tunheim Classroom Building (TCB); a 1921 World War I memorial has been relocated to its new home just south of the campus rose garden. The statue of DSU’s third president and the four-ton boulder bearing the names of students who served in World War I spent many years in front of Lowry Hall. They were removed in February in advance of construction for the new Madison Cyber Labs. While the monuments were in storage, the university hired a bronze artist to assess and restore the artworks. Darwin Wolf, a sculptor from Sioux Falls, has worked on statues at Scheels, St. Joseph’s Cathedral, the South Dakota Music Museum, and Avera McKennan. Wolf reported the DSU bronze works were in very good condition. The design of the 6,800-pound Beadle statue helped as well, through H. Daniel Webster's sculpting style, he said. Wolf used solvents to clean the bronze works, removing grime, paint, spider webs, and then applied a wax coat. He will also provide annual maintenance in the future. “By staying ahead of the corrosion we can keep the sculpture in top viewing condition and prolong the life of the bronze,” he stated. On November 26, a crew from Orion Rigging Company placed the monuments in their new locations, spots determined by a university committee chaired by Dr. Ben Jones, dean of the College of Arts & Sciences. “It’s good to have one of the state’s founders visible again,” Jones said of the General Beadle monument. “Statues, museums, and artwork keep us in touch with who we were, who we are, and who we are going to be,” he stated. For example, the WWI bronze plaque serves as a reminder that DSU alumni for over a hundred years now have played a role in the wider world on things large and small, he pointed out. The General Beadle statue is important, Wolf said, because “this type of art is necessary to keep our history in our view. There's probably a large percentage of our population who don't know who General Beadle was or what he did for education in South Dakota. While a statue isn't likely to educate the public, it does pique the interest of those who will make the effort to learn more,” he noted. The Beadle statue, facing west, will also be a visible reminder of the future for students and visitors who come to campus, particularly after the opening of the Madison Cyber Labs, or MadLabs, in late summer 2019, Jones said. The location near the Karl Mundt Library, the MadLabs, TCB, the Habeger Science Center, and Beadle Hall “places General Beadle in his element of the past while pushing toward the future, a future he had a hand in creating,” Jones noted. • General William Henry Harrison Beadle was DSU’s third president, from 1889-1905. • A native of Indiana, Beadle was a Civil War veteran, a personal friend of President Abraham Lincoln, and was appointed to several important posts during South Dakota’s formative years before statehood. • The school bore his name from 1947 to 1969, as General Beadle State Teachers College and then General Beadle State College. • The bronze statue on the DSU campus was erected in 1937, with contributions from alumni, faculty and friends. A marble statue of the same likeness stands in the South Dakota State Capitol; a third is in the U.S. National Statuary Hall in Washington D.C., a bronze statue given by the state in 1938. • Alumni and community members raised the funds for this monument which was dedicated in 1921 on the location south of Lowry Hall (soon to be the Madison Cyber Labs). • Elmer Davis died in his country’s service; an additional 86 men and women who served are listed.